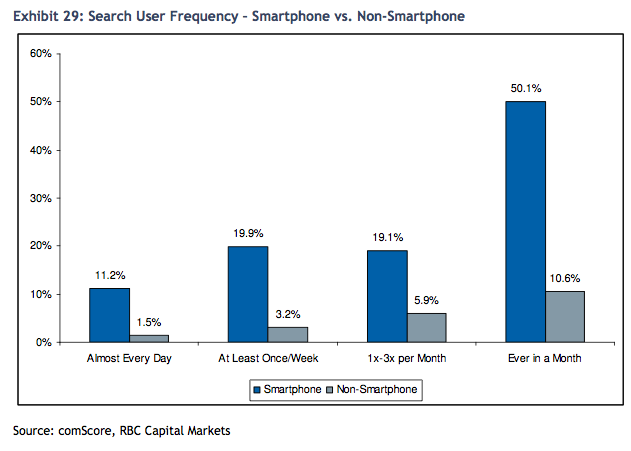 Mobile search could grow from 9 percent of all queries this year to 20 percent by 2012, estimates RBC analyst Ross Sandler in a new report issued today. There is still a huge gap between mobile’s share of overall search queries and its share of search advertising. Sandler estimates that mobile will still represent less than 2 percent of search ad budgets this year, compared to the 9 percent overall share. But he thinks that gap can narrow and that mobile search advertising can be a $2 billion to $3 billion market in 2012. His assumptions seem a bit aggressive on the ad revenue side. There might always be a gap between mobile search share and mobile search ad spending because of the relative effectiveness of search ads on PCs versus on mobile phones. 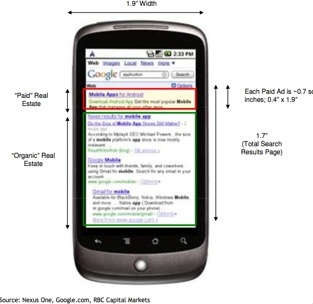 But Sandler does a deep dive into mobile search advertising and comes up with some compelling reasons why that gap should at the very least begin to narrow just as mobile search starts to take off thanks to the growth of large touchscreen devices such as the iPhone, iPad, Android, and Blackberry. One big advantage the new generation of smartphones have over PCs in terms of search advertising is that the screen real estate devoted to search ads is much bigger. A single search ad on a PC takes up about 4 percent of the screen real estate, whereas a single search ad on a smartphone takes up about 20 percent of the screen. The relatively larger size of the ads results in higher click-through rates on mobile (as much as 3 to 5 times as much). On the iPhone, one search ad takes up 22 percent of the screen, and if two search ads are served up it takes up nearly half (48 percent). For Android, those numbers are 18 percent and 38 percent for one and two search ads, respectively. 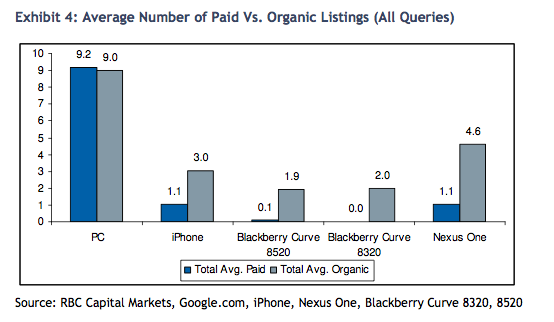 Sandler tested the same keywords across different devices (an iPhone, Android Nexus One, Blackberry, and aPC), and found that the average, for both the iPhone and the Nexus One, was 1.1 paid search results per query, compared to 9.2 search ads per query on a PC. Searches on Blackberries showed hardly any paid results. Another key driver for mobile search revenues should be the growth of local ads. Sandler found that the ratio of localized or geo-targeted ads to non-local ads is still low and expects that to grow as advertisers learn how to geo-target their search ads. Geo-targeted ads should also perform better, leading to higher mobile search ad revenues. So how many people actually conduct searches on their smartphones? According to comScore, half of all smartphone owners conduct at least one search per month, 20 percent search once a week, and 11 percent search almost daily (which is about the same as the percentage of people who search on feature phones every month). This year, Sandler estimates there will be 374 million people with smartphones, increasing to 766 million in 2012. Consequently, the number of smartphone searches will grow from 157 billion to 586 billion (up from 35 billion two years ago). The comparable number of searches on PCs this year will be 1.3 trillion, growing to 1.6 trillion in 2012. Any way you look at it, mobile searches will become a significant portion of total searches within two years. But how much will those searches be worth? That is still a guessing game at this point.